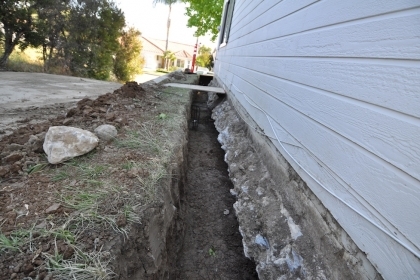 When properly laid a concrete or block foundation can provide impediment-free support to your home for years. However, if not well-maintained it can develop cracks and pits; this can weaken the entire structure and allow groundwater and termites to penetrate your home. Perhaps the most prevalent cause of foundation cracks is excess ground water that can freeze and push inward on the foundation, or water in the concrete mixture; this causes the surface to shrink when it dries, which forces the concrete to pull apart and form cracks. Improper concrete joint installation may also lead to cracks in the foundation. Another circumstance that can cause cracks to develop in your concrete foundation is when the mix dries too quickly. Hence, when building your foundation, it’s important to make sure that the concrete is strong enough to hold up under quick drying conditions. It is therefore recommended that you talk to a professional concrete contractor before deciding which concrete to use. The bottom lines is that left unaddressed, foundation cracks can cause serious problems. One way to prevent cracks in your concrete foundation is to take adequate precautions during installation. Hiring an experienced professional is probably the most surefire way to avoid any structural problems that may arise later on. You can also delay or prevent cracks from appearing in your foundation by using the right materials. For example, an acrylic solvent based sealer applied occasionally may also serve to prevent the concrete from scaling and cracking. It’s best that you call a concrete foundation repair company as soon as you spot a gap or crack in your foundation. This will reduce further damage to the structure and make it easier for professionals to repair the minor issues. Another reason to seek the help of a trained professional is that they have the knowledge to help prevent further damage to your foundation. Even though minor cracks may seem insignificant today, don’t forget that these minor issues can snowball into much bigger problems over time. The best way to deal with them is to call a concrete foundation repair service in your locality to ensure that the job is done right, the first time. If you suspect that your foundation is damaged or needs repairs, don’t hesitate – call the Concrete Chiropractor today at (908) 369-3110.